Rabbit Stew: Lamping Rabbits: Hunting with Headlights! 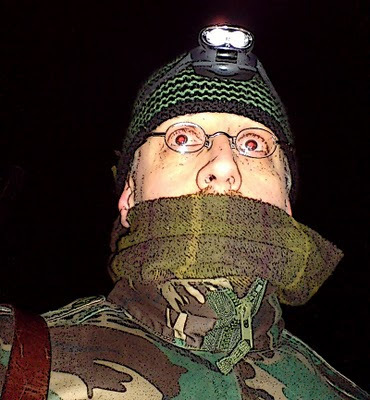 Restless, last night, I strapped an LED head torch to my forehead - a Tesco's two-colour head torch - and strode about in a nearby field brandishing an air rifle. I'd popped out to the fields with this torch once before but I was overcome with embarrassment - it felt like a stupid thing to be doing and I went home again almost at once. This time, however, I was fuelled with enough restless energy to overcome this inhibition: I walked the length and breadth of a few large fields, sweeping the ground ahead of me with the - frankly, feeble - beam from the LED's. I was in a gun shop in Rugeley the other week and there were a couple of air-rifles laid out there with lamps strapped to the tops of their scopes. The lamps were very impressive-looking but also an impressive fifty or sixty quid a-piece; interested as I was to see them, I'm about as likely to purchase one of those right now as I am a Maserati. Nonetheless, the idea of them must have been percolating away in my bonce. The theory of lamping seemed unbelievable to me; I've tried to walk up to rabbits in daylight and shoot them - and they want none of it. Why would this - you'd think, fairly fundamental - self-preservative instinct disappear with the fading of the Sun's rays? It just doesn't make sense. But I'd certainly read about people going lamping and I'd heard the expression 'frozen like a rabbit in the headlights', hadn't I? So I went out again. I didn't come back with any rabbits, but I did learn a thing or two. I walked along one field, saw nothing and kept thinking, 'Yes this is plainly daft, what am I doing here, I'm an idiot.' Then at the end of the field, just before a rise of scraggy brambles and somewhat illuminated by a distant street lamp, I noticed a little lump on the ground. I peered at it through the scope - which is not that easy with a torch strapped to your forehead - and was amazed to see that it was, indeed, a rabbit. I was taken aback but somehow still retained presence of mind to remember that this might be tomorrow's dinner I was looking at. I tried to get a steady aim while standing but it was windy and I was wobbling too much, so I lay down and quickly got off a shot - which missed - and the rabbit ran away. 'Extraordinary', I thought, as I looked around, 'it just sat there while I got into position for a decent shot. Who'd of thought it?'. Encouraged, I climbed a gate and walked up the next field, waving my head from side to side to throw the torch beam around. At the end of the field, about three metres apart, I noticed two tiny glowing lights on the ground. I squinted at them, 'What on earth's that?' I wondered. I peered through the scope: a rabbit - and next to it, another rabbit. Both were sitting stock-still and looking into the beam of the light, each with one eye reflecting it - bright white - straight back at me. I got on the ground, took a shot at one - and missed again. Thinking about it later, I realised that the image of the rabbit's head had all but filled the scope - which means that I was very close and that my hasty guess at distance had been - as they so often are - ludicrously wide of the mark. Despite the prospect of another chickpea curry tomorrow, I left the field in good spirits since it'd been fun and I'd learned a couple of things: rabbits do indeed, incredibly, sometimes just sit there when confronted by a beam of light at night, even the faint, silly light thrown out by a cheap Tesco's head torch. I also learnt that I really do need to learn how to judge distances and also learn where, in relation to its distance from the gun, my .22 pellet is going to be in its own, personal, up-and-down, roller-coaster trajectory. It's all well and good pining for a .177 pre-charged pneumatic with a nice flat trajectory and no recoil - but I don't actually have one of those. What I have is an HW80k Howitzer - and it might be as well if I learned how to shoot with it. Excellent write up..........................a very refreshing change to see it written with honesty and a total lack of "I'm so flippin' ace at shooting" attitude.